Installing the game on 64bit systems requires using fan made installer. Available in CD or DVD form. 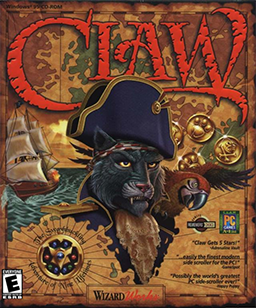 OpenClaw is the open source re-implementation of the game which supports a wide array of resolutions and adds 64 bit support. It can be ran on Windows and Linux. Be aware that the graphics do not scale with the resolution as it simply zooms out. Linux users should install Timidity and set it up to have music in the game. Download the Patch 1.3 and extract the files. Move CLAW.EXE, CLAWREG.EXE and DSETUP.DLL to installation folder, overriding already existing files. Start the autorun from your Claw's CD/DVD. Check Skip logo movie and click OK. Originally it supports 640x480 only. Higher resolutions up to 1280x1024, including widescreen, can be cycled through using the MPINCVID cheat code. Outside of that, see OpenClaw. Can be forced using dgVoodoo 2 or using OpenClaw. Mouse is not used for gameplay. Enable Disable direct video access. Click OK. The game will now run normally. The DVD release of the game only works with specific Creative MPEG-2 decoder cards. This page was last edited on 30 March 2019, at 11:32.